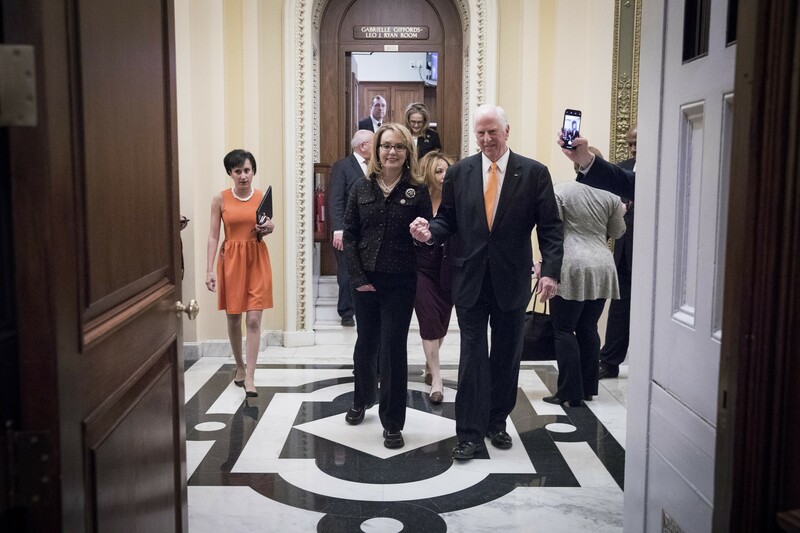 Former Rep. Gabby Giffords (D-Ariz.) and Rep. Mike Thompson (R-Calif.) leave the House Chambers in Washington, Jan. 8, 2019. Thompson is the chief sponsor of a bipartisan bill that would expand background checks to nearly all firearms purchases, a move timed to mark the eighth anniversary of the mass shooting in Arizona that nearly killed Giffords. WASHINGTON — House Democrats, seeking a politically charged debate on gun control, unveiled legislation Tuesday to expand background checks to nearly all firearms purchases, a move timed to mark the eighth anniversary of the mass shooting in Arizona that nearly killed former Rep. Gabrielle Giffords. By introducing the measure less than one week after taking control of the House, Democrats are signaling that it is a top priority. A vote could come within the first 100 days of the new Congress. The bill, which will almost certainly pass the House but will face a steep climb in the Republican-controlled Senate, would require background checks on the purchases of nearly all firearms, including those sold at gun shows and over the internet. There would be limited exception. Polls have shown that most Americans — by some estimates, 90 percent — support universal background checks for all gun purchases. Many Democrats, including Rep. Lucy McBath, a freshman from Georgia whose son was shot and killed at a Florida gas station, were elected last year after promising to address gun safety. “Today we take a decisive step to help save lives right away,” said Rep. Mike Thompson, D-Calif., the bill’s chief sponsor. By limiting the bill to background checks — and keeping out other provisions such as a ban on assault rifles or high-capacity magazines — gun safety advocates hope to pressure Republicans on a policy that has broad public support. In the Senate, Sen. Mitch McConnell, R-Ky., the Senate majority leader, will have to decide whether to bring up the bill. In the House, Republicans will be forced to vote on it. But by narrowing the bill so dramatically, Democrats may also limit its utility. Suspects in many recent high-profile mass shootings had passed background checks when purchasing their weapons. Even so, gun law changes rarely make it through Congress. The measure is similar to one written by Sens. Joe Manchin, D-W.Va., and Patrick Toomey, R-Pa., in 2012. That bill fell to a bipartisan filibuster in 2013 in a Senate controlled by Democrats. Then as now, the National Rifle Association opposed the measure.